I am always on the lookout for seasonal dishes that are normally served as a side to meats or seafood that can take the lead role and stand on their own for a meatless meal. This spin on the classic panzanella salad delivers. It is bursting with peak summer freshness and flavor with a grilled twist. A traditional panzanella consists of fresh summer vegetables (like tomatoes and onions) that are tossed with stale bread and a drizzle of extra-virgin olive oil. 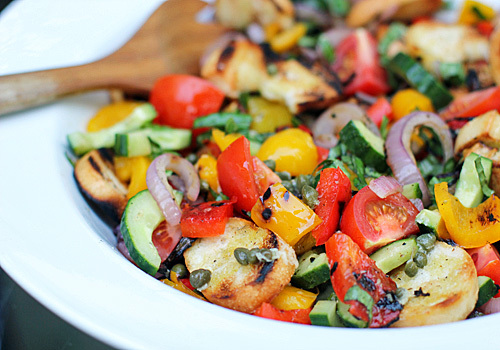 This panzanella consists of fresh vegetables, basil, and grilled vegetables. A few capers add a briny note to the mix. It is all tossed together with a delicious vinaigrette. Once combined, the juices from the vegetables and the vinaigrette are soaked up by the grilled bread--yum! The recipe called for a seeded and chopped large tomato, but I like to use Campari tomatoes for their size and flavor. They are slightly larger than cherry tomatoes and are bursting with sweetness. I add them at the end to keep their juicy insides intact. You can certainly use any tomato that suits your fancy. In fact, you can use just about any vegetable or herb to your liking. Grilled zucchini, squash, or even some fresh oregano would be a welcome addition. As I have said before, make it for you, make it your own. Just please make this dish before the summer bounty is no more! *Tip- After cutting the onion, I carefully skewer each round with a wooden skewer that has been soaked in water. This helps keep the rings of the slice intact when grilling. The soaking also prevents the skewer from burning. **Note- The recipe calls for a ficelle. What is a ficelle? It is a very thin baguette. Ficelle literally means string in French. If you cannot find a ficelle, you can use a standard size baguette, but cut each slice into smaller pieces before grilling. The ficelle I used was about 1 1/2-inch in diameter. In a small bowl, whisk together the olive oil, garlic, mustard, vinegar, 1/2 teaspoon salt, and 1/4 teaspoon freshly ground black pepper; set aside. Place the cucumber, basil, and capers in a large bowl, season with salt and pepper and gently toss; set aside. Prepare a charcoal grill with hot coals for direct cooking. Brush the rack with oil. When the grill is ready, brush both sides of the onion slices and peppers with olive oil. Place them on the grill and cook for 4 minutes. Using tongs, turn the vegetables over and cook for another 4 minutes. Remove the vegetables from the grill and place on a cutting board. Cut the peppers into a medium dice. Separate the onion rings, slicing the larger ones in half. Add the peppers and onions to the cucumber mixture. Brush the bread slice with the oil on both sides and toast them on the grill until golden (they will cook rather quickly). Remove the bread from the grill and add them to the vegetable mixture. Add the tomatoes. Pour the vinaigrette over the mixture and gently toss until combined. Serve warm. Enjoy! That looks incredible! 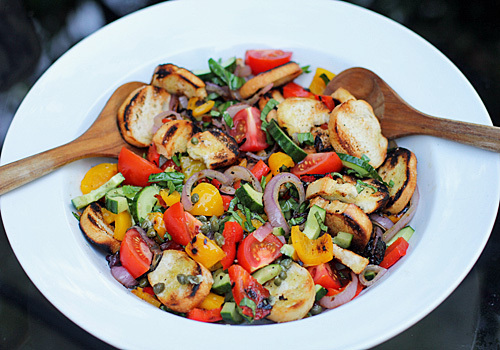 I love panzanella but with grilled veggies really sounds amazing. And I love how bright everything is. Yummy! I love this combination--healthy, great flavors, and gorgeous! This is exactly the kind of dish I crave at this time of year. Fresh vegetables and grilled vegetables is a perfect summer pairing! I crave it summer long. In fact, I made it twice in the past week. I can't get enough of it! I have been meaning to try panzanella but hadn't found a recipe that looked intriguing enough--until now! Thanks, I can't wait to try this. This looks like a perfect summer meal! YUM! 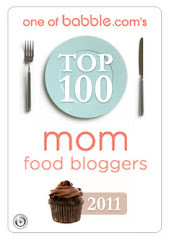 I do hope you give this dish a try! Your directions don't use the listed vinegar. Thank you for catching my typo.